I just saw my email for the Black Friday sale. When I purchased my xxl I didn’t realize that there was going to be a sale coming up and just my luck I miss it and even the cutoff for past purchases. This happens though so I understand it is what it is. What I am really frustrated about is the free touch probe. I have been waiting for it to come back in stock and from what I have read it’s been hard to get since they started offering it. When am I going to be able to get my hands on one and what does this sale mean for availability? Are these sale orders going to take priority for probes when they become available again? The free probes are not likely to all ship immediately. We have a batch being made now so we’re hoping to get a few in stock in the near future. We’re going to see where we net out in the next day or so and we might turn on backordering for the probes if it looks like we’ll be able to manage the overall backlog well enough. When am I going to be able to get my hands on one and what does this sale mean for availability? Are these sale orders going to take priority for probes when they become available again? I waited on the Shapeoko in part because I figured there’d be free shipping at least, but also because tomorrow’s my birthday and I figured it’d be decent justification for giving myself a Shapeoko. Knowing how the touch probes have had fleeting availability and that I’d want one from day one, I was watching religiously and managed to grab one when the last batch hit. 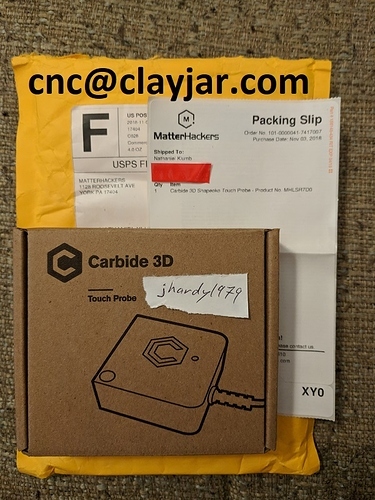 Well, Happy Birthday to me, my Shapeoko XL is now ordered, and naturally, the Black Friday perk this year is a touch probe on top of the free shipping. It seems, @jhardy1979, that we may be on opposite sides of the Black Friday 2018 coin – you’re trying to get a touch probe, and I’m going to end up with one too many. Perhaps we should combine our situations and have me allocate one Shapeoko Touch Probe from my going-to-be overstock to step up to the (touch) plate and bring balance to the Force? From the sound of it, I should end up with either a very brief lag between Shapeoko and Touch Probe or no lag at all. If I’m not going to have to wait (or at worst, not long), there’s really no point in me hanging on to the Shapeoko Touch Probe and no machine when you have a machine and no probe. If you want to email me so we can get the details handled (e.g. address, etc. ), I’ve got a never-removed-from-box Shapeoko Touch Probe with your name on it. Received the touch probe today. Thanks again man you’re awesome!!! Excellent! Glad I could be helpful.